Is that a microphone you're holding or are you just happy to see me? 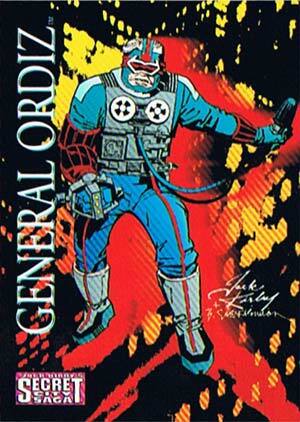 From the pages of "Jack Kirby's Secret City" comes the ferocious General Ordiz and his ... tape recorder? Seriously, his shtick is that has a tape recorder strapped to his chest with a long wired microphone thingie in his hand. At least I sure hope that's a microphone, because the other thing it looks like, well, it's not really appropriate for a family-oriented blog. It would, however, be very scary to see one wielded by your opponent. I don't have any issues of the saga wherein General Ordiz takes any sort of direct action, but I'll bet his trademark Witty Repartee is something like "Any last words?" right before he beats the snot out of his enemy with his club/microphone/deviant toy. 2 Responses to Is that a microphone you're holding or are you just happy to see me? Erm, while I haven’t read the book itself, the image you’ve got posted says ‘General Ordiz’, which I’m assuming is a pun on the idea of general orders: http://en.wikipedia.org/wiki/General_Orders. What you kept putting in the text was ‘General Ortiz’. While I admit it’s possible that’s what it says in the story (I believe I mentioned that I haven’t read it? ), it just doesn’t look correct. Thanks Ender, that was just an accident. I corrected it now, appreciate the catch.